I will photocopy some practice borders from the Basketmaker’s Association Borders books so that everyone will be able to have a go at something from a diagram but with a helping hand near should you run into trouble.. If you are coming to the meeting for the first time it would probably be as well for you to be prepared to meet new friends, watch, eat cake, have a drink and chat and have a look at our lovely book collection. Something to look forward to – we will be having a bit of a do at Kathy’s lovely house in Cardiff Bay on July 25th from about 7pm. More details to follow but put the date in your diary. Thanks Kathy! Before leaving for holiday in Pembrokeshire we travelled up to Llanidloes to set up a stall at the Wool and Willow festival. 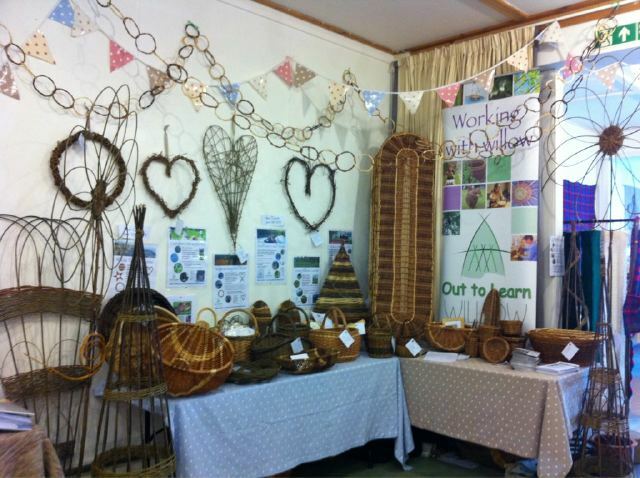 This is a lovely month long festival showcasing the work of lots of willow and wool workers from around Wales. We set up our stall so that the courses we run are fully exhibited and illustrated – even the Christmas one, it was a little odd rooting round in my Christmas decoration box in May but I have to say the stall looked great. Mel is running a frame basket course there on the 18th June but there are lots of other things going on throughout the month.